There are some things that are obvious. Like the fact that spring will come after the winter. Or that Ubisoft will make a new game from the Far Cry series. Here is one of those series that last and last, and probably will last for a long time. Ubisoft found a format that worked well, promoted the brand, now it creates more parts, changing only the scenery. Sounds familiar? No, I'm not talking about Assassin's Creed, but about the second series - Far Cry. Already today, and actually on the night of Thursday to Friday, there will be a gala ceremony The Game Awards, during which prizes will be awarded for the best games of 2018. The event will also be an opportunity to announce completely new titles. It was confirmed that there will be more than ten of them, and the rumors about what we will get there, have been on the Internet for a good few days. The latest - and very real - is even the existence of the Crash Team Racing remaster . Ubisoft does not ask you to guess - it is a promise that there will be a new Far Cry. And post-apocalyptic. In the first scene, we see a terrain that is strikingly similar to American Montana, in which we shot at Far Cry 5 . Then we see an atomic mushroom that sweeps it all off the face of the earth. People familiar with Far Cry 5 may guess that the new part will be connected with the predecessor in some (probably minimal) degree. So we have a post-apocalypse in Far Cry. In the tropics, prehistory or American backwater, nothing should come as a surprise. There are several things to learn from the teaser. First of all: the world after the nuclear catastrophe began to revive (even flowers appear). Second of all: of course, no one is safe, probably by bandits and, in general, feral remnants of civilization. Thirdly: one of our weapons will be the saw blade launcher. These blades can be a significant marketing element, because teaser devotes quite a lot of space to them. 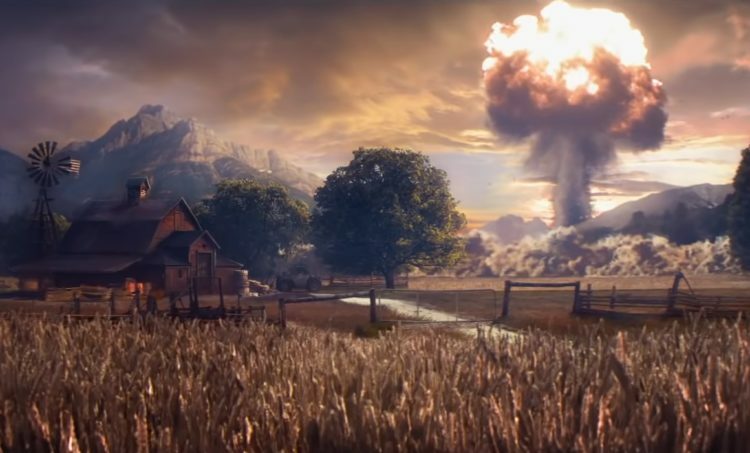 Poki what, however, is all we know about the new, post-apocalyptic Far Cry. It must be admitted that for a "preview of the announcement" it's still a lot. We'll get to know the rest of the details at night. I suspect that through the chosen subject the brand may arouse the interest of people who have ignored it so far. Only will the Metro: Exodus be met by our needs for first-time shooting in the post-apocalyptic world?